So a good day for England, but still plenty of work to do to hammer home their advantage. Join us tomorrow for what promises to be a gripping day three. Until then, goodbye. "Up towards the end of the day, Pakistan had a plan - they stifled England and there were only 48 runs in the afternoon session. Later on the bowlers tired. "England did a very good professional job - they should be proud of themselves. They won the battle today but they haven't won the war." Alex in Dubai: Headline pun: 'Tinker Taylor, Solider Sharjah'. "Bairstow played very well. He is an attacking player but he tried - and, as a unit, the batting did well. What they did, they did well - slow, patient batting to put England in a position from where they can win." Guy Giles: Are the people going after Bell those who were calling for Cook's head 12 months ago? More from Ian Bell: "James Taylor is a wonderful player of spin, the way he swept and used his feet. His partnership with Jonny was really good - they were busy and looking to score. "Ben Stokes is alright but absolutely gutted. He's going around with a smile on his face. Hopefully it's not as bad as people think." "I wouldn't say England are fully on top. But they've put themselves in such a condition that it might allow the bowlers that bat to attack the bowling tomorrow. A lead of 50 or 70 would be good but anything else would be outrageously marvellous." "England have applied themselves - you can see they're very committed to getting a first-innings score. It looks like they have learned from that collapse in Dubai. "If they can bat another session and a half, they will get a 100-120-run lead, which will be huge in this match. You just never know with England - but they're in the box seat." England batsman Ian Bell on Sky Sports: "It's been a really tough day's Test cricket. I thought Pakistan bowled really well, but we're really happy with how today has gone. "We knew that run-rates wouldn't be high. It's not about what it looked like, but trying to get the job done. Whatever lead we get will put in a good position. "Anything up to 100 would be fantastic. It's really teed up for a good Test match. "Today was a batter day to bat so hopefully we can cash in tomorrow morning." "Well done to Bell for trying so hard to rein in trying to whack the ball hard. He made 40 good runs - 40 slow, patient runs is better than hitting a quick two or three fours and then getting out." Taylor really was the star of the show today. To come in and play an innings like that after three years out was immensely impressive - is he now a fixture in England's middle order? Is he the long-term heir to Ian Bell? "Taylor played very well and I'm pleased for him. He has got a good defence, he's got nice footwork, quick footwork, lovely hands, he can manoeuvre the ball, and he's quick on his feet, and he run quick singles. "England adapted very well today. They were error-free apart from Moeen Ali playing the daftest shot early on." "What a day it has been for England. When the fourth wicket fell, Pakistan were right on top. But James Taylor has played with control - I can only think of one error. "He has swept hard, he has swept fine, he has cut the ball, he has hit the ball to mid-off and mid-on and run singles. We have been reliant on Joe Root and Alastair Cook for many Tests, but Taylor has held the innings together - he has been the glue." Lee Welsh: Clumsy sportspage headline tomorrow might be, 'Someone else other than Cook or Root top scores for England'. The day has belonged to James Taylor and he signs off in style by rocking onto the back foot and leathering Zulfiqar through the covers for four. And that's stumps. A superb day for England. Chris Rose-Angus: Why do we keep going on about Bell when it's clear to see that the real weak link is Root. To get four in the last innings is nothing short of a national disgrace and he should be dropped ahead of the second innings. England, understandably, edging back into ultra-cautious mode as stumps approaches. Just a flicked Taylor single of the over. "People will say it's due, but the manner in which they've played... a lot of skill has been required by the batsmen today." Just four overs for England to survive, and it looks as though two of them are going to be bowled by Pakistan's go-to partnership-destroyer Yasir Shah. Plenty of effort from Yasir as usual, a lot of spring still left in the delivery stride, but he can't find a way past the solid defences of Taylor and Bairstow. "It's been a real tough wicket to bat on. But Taylor has made it look simple, which is the biggest compliment you can give him. He clearly trusts and believes in his game. I'd say he's going to be a fixture now in the Test team." Pakistan are flagging a touch here in the evening gloom, allowing England to pile on some valuable runs - Bairstow creams Rahat to the fence for four. But the left-armer has a great riposte up his sleeve - slanting one across Bairstow and almost inducing an edge. Yasir is back to try and winkle out a wicket before the close. He's been the most threatening of the Pakistan bowlers so far, but he doesn't trouble Taylor and the increasingly assured Bairstow in this one - two singles from it. "Four and a half overs with the new ball have gone for 23 runs." The 200 comes up, off a rather sedate 85.4 overs, with a Taylor flick to square leg, before Bairstow swivels and dispatches an authoritative pull through square leg. Jack Harrison: Knew I should've put that tenner on Taylor scoring a Test century when I first saw him bat aged 16 at Shrewsbury School. Tattz: Ladies and gentlemen - we have a third batsman in the team! No longer will Root & Cook suffer alone! Welcome Mr Taylor! The new ball is just allowing Taylor to lift the tempo - he times it beautifully through the covers and picks up a boundary. It's been a disappointing day for Zulfiqar - he'd have woken up this morning licking his lips after the way the pitched behaved yesterday, but so far he's bowled 22 wicketless overs. Andy: People can defend Bell, but the stats don't lie! He isn't making match-winning contributions and he's not the player he was. Keith Woodley: Bell's issue is not his ability to make 40 or so, it's making that score into a match-changing innings. That's what the best do. David: Good 40 in the circumstances this is Test match where a side got 240 batting first - perspective ladies and gentlemen. Bairstow glides Rahat down to third man and some strong running turns it into three. England have hung in there really well today - now can they negotiate their way through to the close? Northern Horners: Here's hoping a nice new cherry will bring about an acceleration in scoring and we get up to parity tonight. Zulfiqar is going to have the new conker from the other end - can he get a bit of grip and purchase with the pronounced seam? Not much in evidence in his first over - and off the final ball Taylor punches a single to bring up the 50 partnership. He and Bairstow celebrate with a good old-fashioned handshake. Lovely. "Taylor has looked busy, he's pushed for singles, but the shot selection too: he's played positively in defence, swept nicely, always looked in control." Taylor's excellent vigil is almost ended in the most comical of circumstances as he defends one from Rahat Ali, sees the ball bounce up behind him but can't locate it as he desperately tries to stop it rolling back onto his stumps. He manages to boot it away just in time. Midway through the over, Rahat opts for the new ball. Now it's Bairstow's turn to get lucky, cutting one too close to his body and seeing an inside edge fly a whisker past the stumps. Close. Francis Edwards: Bell makes 40 and he should be dropped, Taylor makes 50 and his best score by quite a bit and suddenly he's class... fickle. Azhar has got a bit of skill about him - he drops in a lovely googly that beats Bairstow all ends up, turns past the inside edge and hits him on the pad. Typical isn't it - you see off one world-class leg-spinner and suddenly the opening batsman comes on and starts bowling grenades. "Top innings. It's never easy after you've been sitting out Tests, but he has run well and played beautifully - cutting the ball, sweeping the ball and every now and then using his feet." Joshwin Maharaj: James Taylor proving that he is an international class player and the England selectors don't have a clue what they are doing. Chris Gunn: Taylor has been sniffing around the England team for too long. Glad he's got his chance and showing what he's made of. Evan Samuel: Well played Taylor - great way to return to the Test side. Taylor works Wahab off his pads for a single, and that's his fifty. What a superb knock it's been - playing in his first Test match for three years, he's shown composure, a busy temperament and some deft strokes. If England are going to get up to Pakistan's score, or even get a significant lead, it's crucial that he stays in. Misbah decides to try something different and turns to the occasional leg spin of Azhar Ali. Taylor can really scamper between the wickets - he's like a hamster in a wheel - and he pinches a couple of quick singles. Andy Gould: I don't think Pakistan batted more positively, the difference is just that their spinners bowl less bad balls. Wahab has bowled pretty well today for no reward. He fires a real effort ball in at Bairstow's toes, but the Yorkie keeps it out. "Pakistan's scoring rate for the series has been about 3.3 runs per over. England's has been about 2.8." "England won't be ahead of Pakistan tonight - no chance, unless someone goes berserk." Yasir Shah sporting the miniature triangle of facial hair underneath the bottom lip. Is there something about the soul patch that gives England problems? Mitchell Johnson and Peter Siddle both sported that style during their Pommie-destroying pomp. Taylor is looking really comfortable with the sweep shot - he gets down and forcefully paddles Yasir against the spin for four. "Advantage England. They have batted really well. Bell played a really intelligent innings - he negotiated the turbulent times very carefully and James Taylor looks a complete natural when playing spin. England are now looking a lot easier and happier." Big appeal from Wahab as he strikes Taylor on the pad, but there was an inside edge on it. England inching towards parity. Let's all have a beverage shall we? "Misbah's just beginning to think, 'I could do with a wicket here...'"
The trap is set for Bairstow: slip and gully waiting, man on the drive, Yasir trying to lure him into the expansive drive. But for the moment, young Jonny resists temptation. "The shot of the match." What was it they used to say about goalkeepers who couldn't keep out a well-struck shot? Chocolate wrists? Well, Bairstow has the opposite problem: if his wrists are made from any sort of confectionery, it would be Blackpool rock, or a extremely hard toffee. He tends to go rather too forcefully at the ball - not a method that is widely approved in these conditions. But for the moment it's working for him - he times a leg glance off Wahab perfectly and the ball races away to the fence. David Perrins, Birmingham: Could Bell open in South Africa? Taylor already looks deserving of his place in the middle order so maybe the resolution of the problematic opening partner for Cook is staring us right in the face! He's done it for Warkwickshire and opened in ODIs plentifully. Bairstow is a player to whom a bit of biff comes naturally and he doesn't seem entirely comfortable to plod along at one or two an over. So he essays a couple of big shots against Yasir: the first a hard-handed drive out of the rough that misses the ball completely, the second a hoick from outside off that is more successful. He connects and sends the ball to the midwicket boundary. Bairstow has a habit of squinting before each delivery that isn't entirely encouraging in these circumstances. Still, he and Taylor keep things ticking over with three singles. Simon Smith: Is Ian Bell the cricketing version of a well known savoury spread? You either love him or hate him? England have lowered the portcullis here. Bairstow, whose presence at the crease is inspiring plenty of oohing and aahing among the Pakistan close fielders, plays out a maiden over from Yasir. All about survival for the time being. "I like the fact Taylor is quick on his feet. He has a good defence against the spinners; he has nice hands, good wrists; he's not always looking for the big shot." Taylor blocks out a maiden from Zulfiqar. Taylor has played very well in his comeback innings. Soft hands, supple wrists, calm head. Looking to divert the ball rather than bludgeon it. He and Bairstow pinch a couple of singles off the menacing Yasir. AndytheBear: Can we stop praising the batsmen please, because as soon as we do they get out! Bairstow looking a bit uncomfortable against Zulfiqar. The left-armer gets one to straighten and hit Bairstow on the pad but I think there was a bit of inside edge involved. Nick Edwards: Everyone calling for Ian Bells head. But who'd take his place!? We need him around for a while more! Ian Cottam: Ian Bell critics can jog on! That was a key innings on this pitch. He still has plenty to offer at this level. Billybunter3rd: Predictably, out come the Bell knockers - unbelievable! Very good innings by Bell who's averaged 40 in this series. Ooh, Jonny. Trying to work Yasir against the spin, which is a dangerous game. He gets a leading edge which drops just short of the fielder. He's fine. These two have got a decent turn of pace between the wickets. "That is only the second time Ian Bell has been stumped in his 200 dismissals. "With a strike-rate of 25.31, it his second slowest score of 15 or more - and it is the slowest innings of 40 of more by an England player since Mark Butcher made 51 off 201 balls against Sri Lanka at Galle in 2003." Yasir has been excellent - full of bounding energy in that run-up finding plenty of fizz off this pitch. He's had the England batsmen groping, prodding, as unsure whether to go backward or forward as if they're halfway across a rickety rope bridge over a canyon. Taylor, who has played him as well as anyone, takes him for two through point. Jack Byrne: For a man of 117 test matches that dismissal is unacceptable, time for Ian Bell to move on from Test match cricket. Ben Thapa: Thanks for a very good career Ian Bell. Time to step aside with grace and dignity. So, an uncharacteristic knock from Ian Bell, grittier than sandy sandwiches at a beach picnic, but once again he departs having failed to convert a good start into a really meaningful score. Is the bell finally tolling for Bell's England career? That debate will go on, but for now it's hello to Jonny Bairstow, who wouldn't be high on your list of 'Men for a crisis', but finds himself thrust into that role nonetheless. "This is wonderful from Yasir Shah. He has shown his qualities today. Bell has had the review, the chance to silly point and he's decided to dance down. It dips in, Bell tries to defend but there is sharp spin. It's quick hands from Sarfraz too. It's worrying times for England, especially with the ball doing more after tea." Third time's a charm for Pakistan and Ian Bell's vigil is over! Lovely leg break from Yasir, Bell is drawn forward, the ball spins past the edge and Sarfraz whips off the bails with Bell stranded. "It's comedy gold. Silly point is quite deep and he has no idea where the ball is. It lands about three feet away. It's a good start for Pakistan, even though England haven't lost one." And now another huge let-off for Bell! He drives aerially, it hits Azhar Ali at short leg on the shin and balloons upward, but Azhar loses sight of the ball and is reduced to comically groping for the ball as it falls to earth about three yards away from him. Zulfiqar manages to see the funny side. An over that veered from high drama to farce. "There's just not enough to overturn it. It's ridiculous that there's not any HotSpot or real-time Snicko in this series. If Bell had been given out and he'd reviewed it, there wouldn't have been enough to overturn that either." Well, bat and ball were certainly adjacent on the replays, but there was no way of telling whether there was a nick. Pakistan were convinced - Sarfraz was yelling and hopping about like a man who's just trodden on Lego bricks barefoot - but Bell survives. "I think there's an outside edge, but is there enough technology to overturn the decision?" Thank you Stephan. The game remains very much in the balance: England arguably slightly better placed at this stage, but neither side have yet made a decisive move. But by the end of this evening session, we could have a much better idea of who will win this Test match. Tea break almost done, James Gheerbrant has returned to the chair next to me and is here to talk through the evening session. Ali Mannering: James Taylor has been showing this form in domestic cricket for the last 2 seasons (and more). Why has he had to wait this long? Sam Barrick: Really liking what Bell is doing today grafting really hard, showing a side of him that we see very rarely, he should keep his place. "England will be happy with that - three down at tea. They will be hoping for much of the same after tea. You just feel that there is the potential for Pakistan to take a cluster of wickets and put the pressure right back n England. But at the moment they'll be saying, 'Keep it going boys'. Ian Bell anchored England's reply to Pakistan 234 on a keenly contested second day in the final Test in Sharjah. Bell was unbeaten on 40 off 151 balls as the tourists took tea on 135-3, trailing by 99. England scored only 48 runs in 27 overs during an afternoon session which saw two wickets fall. Alastair Cook (49) and Joe Root (4) perished in the space of five overs to leave England 97-3, but Bell added an unbroken 38 with James Taylor, who is 26 not out in his first Test since 2012. "Taylor is looking increasingly confident. He's very comfortable against spin - nimble, lithe. He has played very well on his return to the Test team - he looks totally at home." England get through, Taylor and Yasir jousting all the way to the break. A Taylor cover drive for four, Yasir responding with a ripping leg-break that goes past the outside edge. A pretty enjoyable session, even if runs did not flow. Two wickets looked to have Pakistan on the charge, but the battle to survive for Bell and Taylor has made good viewing. England slightly on top? Maybe. "It's a grind. England are grinding their way there." Ooooffff, this is a huge appeal for caught behind against Ian Bell. Babar gets one to spin sharply, the ball ending in the gloves of Sarfraz. Not out. If they are appealing that loudly, why not review? Either way, it hit the back leg, so nothing doing. That's perhaps the most turn we've seen all day. Yasir Shah will have taken note. Maybe one over left before the break. "Those were the first runs Rahat Ali has conceded since his seventh over - this is his 12th." Nice from Taylor, who eases Rahat through the covers for a couple. Miffed, Rahat tries Taylor with some short stuff for the first time. You know the old saying about shorter batsmen playing the bumper well? Taylor just gets into a little tangle here. England survive another, though. Five minutes until tea. Graeme Lowe: Really hope James Taylor takes his chance because, up to now, the selectors have been reluctant to give him one. They were rather forced into picking him this time. He is a classy player who can really get under a bowler's skin. He should have been in the team ages ago. Babar is over the wicket to Bell, employing a middle-and-leg line, hoping the right-hander will play against the spin. Bell, though, is in good order, dancing like a man who could continue cricket's fine tradition on Strictly. If Bell is the Viennese waltz, all light feet and twirls, Taylor is the Pasodoble. Not subtlety, just a jackhammer of a sweep. "The one thing that Bell doesn't have is that real deep confidence in himself. The best players have a touch of arrogance in the way they comport themselves. Bell's a wonderful player, but he doesn't give you that - he needs encouraging." The score has not rattled along in this session, but it's been interesting stuff. You know how when some pundits say the cricket has been 'absorbing' when what they really mean is 'boring'? Not the case here. England's battle to hang in has been genuinely compelling and, for the moment, they are coming through. Get through to tea and the opportunity to reap rewards this evening could be there. It's unlikely they'll be level by the close, though. Paul from Reading: I'd make Merv Hughes an Apprentice advisor. He would say in no uncertain terms what he thinks of the contestants. James Taylor is warming to the task, getting low to powerfully sweep the skipping Babar square of the wicket for four. It's been impressive so far from Taylor, who has come through a tough patch on arrival and is now looking to score. He won't win any aesthetical prizes, but his idiosyncratic, twitchy method is suited to these conditions. "So far in this match, the seamers have gone for 1.35 runs an over and have taken seven wickets at an average of 11.5. The spinners have gone for 3.3 runs an over and have taken six wickets at 44." He hasn't hit it, so it's not caught. It's not hitting the stumps, so it's not lbw. One of the all-time awful reviews. A review worse than the ones Die Another Day got. That really was a bad Bond film. "That just didn't look right to me." "England are desperate for full tosses or short ones just to get the scoreboard ticking, but so far they've not arrived. You've just got to keep playing and hope that you can build a partnership." Mark Wood and Liam Plunkett chat in the England dressing room. Plunkett's had a steady tour. The odd bowl in the nets, bit of drinks-carrying, enjoy the water parks of the UAE. Where do you apply for the job of back-up pace bowler on a cricket tour in Asia? You're as likely to be used as WG Grace's beard-trimmer. Nice from England, Babar worked for a trio of singles. Sticky patch getting a little less sticky. Andrew: Ian Bell averages 40 in this series. Only he would still be 'under pressure'. I R Bell: providing doubters wrong since 2004. Jonathan Barton: Can you please remove "Bell stands firm for England" from the summary before he doesn't and its your fault. Thanks. Misbah strokes his chin as Bell gets away with an uppish flick through the leg side for a couple. That's as iffy as Bell has looked for a while, and normal service resumes when he straight-bats Riaz's full length. There's just over half an hour before tea. England have won a little battle - Yasir Shah is withdrawn. The aged figure of Zulfiqar Babar comes on to tweak his left-armers down, producing an absolute rozzer that does for Taylor all ends up. Turn, bounce, beating bat and off stump. Babar gives Taylor a little word. He should pick on someone his own size. Simon: I'd love to see Geoffrey's no-nonsense, says-it-how-it-is approach in the Cricket Apprentice. Maybe as an aide? PtheP: Gotta be Shane Warne as Nick with his permanent look of surprise. Riaz, trousers almost indecently tight, decides he needs a word with Misbah. Switch from round to over the wicket, Taylor leaving and defending with more limbs than an octopus. Still there's noise from those unseen Pakistan fans, they clearly have more energy in the heat than the England supporters, who are yet to be heard in this match. Another maiden. Only 23 runs since lunch. "That was the first boundary since lunch." I reckon James Taylor would go well in a cricketing dance-off. It's the fast feet, you see. When Yasir drops a smidgen short, Taylor skips back to crack a pull shot for four. England might just be coming through that sticky period. Fewer demons around, batting looking a touch more comfortable. Jack Mendel: This is typical Bell. He always does well as he's about to get dropped. If he gets 50+, should secure his spot for a while. Jack Byrne: This is the chance for Ian Bell - all the experience, he has to be the man to get a big score here and get England a lead. Wahab Riaz, who may soon have to ask Graham Gooch, Shane Warne and Jacques Kallis for hair advice, urges his long legs towards Ian Bell. Sweat on his brown, untucked shirt flapping up his back, Riaz changes the angle to the immovable Bell, looking for some reverse hoop from round the wicket. A maiden after drinks. "It's even stevens. England have got two batsmen in, but two quick wickets and it's 120-5, which doesn't look so clever. Whoever grabs the initiative here, that will define the Test." I'm also wondering who the cricketing version of Lord Sugar could be? Andrew Strauss doesn't seem to worry about firing people, so he could be the man. Yasir gives the ball some air, getting it above Taylor's eyes (not hard, admittedly). It's feisty, with Yasir feigning a throw back at the batsman. A scrap between this pair of pocket dynamos would be very aggressive, possibly turning dirty. A pre-drinks maiden. Charles Isere: Let's not forget that Pakistan were 116-5. One decent partnership could rebuild this innings. The question of who Lord Sugar's advisors would be in a cricket-themed Apprentice is put to me. Who are cricket's most trustworthy sages? Mike Atherton? Steve Waugh? Graeme Smith would be good for a withering boardroom put-down. England are going nowhere here, they are 17-2 in almost an hour since lunch. Bell absorbs the pressure of new bowler Wahab Riaz in the silent Sharjah sunshine, counter-punching with a drive for a couple. John in Lytham: From looking benign and relatively friendly the wicket now looks a bit of a minefield. That wicket of Cook has transformed the match, the spinners have come alive and now extracting life from it. Still on a knife edge, wondering if an England collapse is on the cards? Taylor, short of stature, is so unlike his batting partner. Whereas Bell is economy of movement, timing and elegance, Taylor is a ball of energy, dancing forward and skipping back, never standing still. A cut off Yasir gets him off the mark, but an aerial drive wide of the man at short cover is less convincing. "Those two wickets have just put a different complexion on the game, they've got Pakistan back in it. England have got some serious work to do." Just going back to England's constant search for an opener, could they perhaps employ Lord Sugar to find one? Get some hopefuls, put them through a string of tasks, fire one each week. Not sure what the tasks could be, mind. Maybe padding up at speed? Fending off an hour of Mitchell Johnson bouncers? Rahat is getting some reverse swing, angling across Bell with the ball then tailing even further towards the slips. Bell remains patient. "Bell hasn't looked in any trouble. He hasn't played and missed. If he played as carefully as this on other pitches, he would get more runs. 30 slow and steady and better than 10 quick flash out." This is the ball game, right here. A bad hour from England and the series could be gone. If Bell and Taylor can get through then the tourists still have a chance of a precious lead. Bell has been solid since lunch, so much so that the whirring Yasir Shah switches to round the wicket. Bell, sweat dripping from his helmet, is in good order. Defence stout, feet moving. Bowser: You can't ever judge a pitch until England have collapsed on it. Geoffrey Boycott heralds the arrival of James Taylor, in his first Test innings since Lord's 2012 v South Africa. He has a big job to do, England have lost two quick ones and still trail by 137, with Ben Stokes unlikely to bat. We see replays of Root's dismissal here and the first innings in Dubai - very similar. Left-arm over bowler, slight width, pushing at the ball with the foot not to the pitch. Taylor is immediately in to his fidgety, energetic style, leaving and defending. "It's getting the first few runs that is so difficult in this situation. Your feet don't go exactly where you want. I've seen some serious players in my time, and let me tell you, James Taylor can bat." It's as brilliant from Sarfraz Ahmed as it is deflating for England. Joe Root didn't need to play at this, he's limply pushing at a Rahat Ali wide ball and getting a thick edge through to wicketkeeper Sarfraz, who dives to his right and take the ball one-handed inches above the grass. Replays show there is no doubt - the ball went straight in. Root is a wonderful batsman, rated the world's best, but we see him fall in this fashion quite often. "He's staying because he's not sure whether it carried. A lot of these decisions about low catches they've got right - my instinct is this is out." "It's a cat-and-mouse game: runs at a premium, slow outfield, batsmen having to show patience. It will be a question of who can hold themselves together." James Taylor, playing his first Test in three years, waits. What goes through your mind when you're waiting to bat in a Test match? How will I perform? How many chances will I get? I'll just bat like I do in county cricket. Did I turn the central heating off? Root currently as edgy as Bell is fluent. A premeditated sweep from the Yorkshireman hits the toe of his bat and lands safely. Could have gone anywhere. David: I'm risking it, in years to come when they show "Ian Bell - Crickets Greatest" on TV this is the innings they will focus on. Responsibility now on the shoulders of Ian Bell, who actually averages almost 50 in this series. He looks doesn't mind Rahat probing his off stump, easing a drive behind square for a couple. Some unseen Pakistan fans in Sharjah make a bit of a din, providing a soundtrack of chants and whistles. This is the most absorbing passage of the day do far. "One thing that Root will do is look to score. If he can survive for half an hour, he will look to try and dominate the bowlers, which can only be a good thing for England." Pakistan will be thinking that one more wicket has them in to the recalled James Taylor, the probably absent Ben Stokes, the iffy Jonny Bairstow, then the bowlers. Yasir hangs it outside of Bell's off stump, then explores a googly. Only four runs have come in the six overs since lunch. Cook also fell to Yasir is similar fashion in Dubai, turning a leg-break to leg slip. Expect more of that line in the second innings. As always, the fall of a wicket makes batting look all the more difficult. Root isn't sure whether or not to play at Rahat and an inside edge falls short of the wicketkeeper. Now some reverse swing sees the outside edge beaten. It was serene before lunch, but now England are trying to hit a golf ball with a brush handle. "You can see Yasir's spirits lifted by that wicket. There's that little bit of extra fizz and busyness in his action." We've spoken about how Yasir Shah could be the man to spark something for Pakistan - have we just seen that spark? Perhaps Cook ruminated over lunch and thought that playing back was the way to go. He should really have been forward and guiltily looked down towards the umpire as the catch was taken. He knew he was toast. Joe Root the new man, greeted by a fizzing Yasir leg-break. Dangerous times for England. "Cook went back to a ball that he could have gone forward to. It spun and fizzed and just hurried into his pads. That's a big wicket for Pakistan, but Joe Root is the perfect man to come in in this situation." Gone! Yasir Shah has been targeting the pads of Alastair Cook and finally has his man. Cook was twice lucky before lunch that inside-edges did not go to short leg, but the third time is a charm for Yasir. Cook was previously defending on the front foot. This time he goes back, turns the ball on to his leg and sees a simple catch loop to Azhar Ali. Yasir is spread-eagled in celebration as Cook first thinks about a review, then walks off. Big moment. "The way Alastair Cook is playing is helping Ian Bell. I've not seen many plays-and-misses. As long as you don't make mistakes yourself, I don't see how the bowling on this pitch is going to bowl people out. It's comfort zone. England should be able to finish the day in front of Pakistan with four or five down." Rahat Ali, sporting an excellent side parting, is playing on Ian Bell's patience here. Left-arm over, hang the ball outside the off stump with three grabbers waiting behind. Bell disdainfully shoulders arms. A battle of wills that doesn't make for the most compelling cricket. "You just feel that Yasir is the guy who has got something up his sleeve, who could take wickets in a cluster." Come on, Peter. The last Potter film came out in 2011. You do know that Darth Vader is Luke Skywalker's father, right? Or that the boat sinks in Titanic? The dangerous Yasir Shah after lunch, whipping a leg-break into the pads of Ian Bell. Pakistan holler, but it looks leggy and there's a hint of an inside edge. Apart from that, it's a good shout. Cook waits with a slightly open stance, short sleeves curiously placed high on the bicep. Rahat shuffles in, not generating any great pace, but on a line that keeps Cook honest. A straight-batted maiden. "England will be absolutely delighted with that morning session. Days like these are all about partnerships. The pitch isn't quite behaving as we thought - it's cracked and dry but it hasn't really exploded." The players have finally wandered out. Left-arm pacer Rahat Ali has the ball, Alastair Cook is on strike. Two slips and a gully in place. As ever, there are as many clouds in the sky as there are spectators in the stands. Phil Coulson: England's opening problem started when the problems with "He who should not be named" (KP) started. Coincidence? Shouldn't we have started by now? A very tardy return from the lunch break. We can't even blame Samit. "Ben Stokes isn't looking like he's going to play a part in this game. If he does bat, you can't imagine he's going to be of any worth." Gordon Thursfield: Local pitch doctor assures this is the best day for batting. Let's not leave it all to Root and Cooky chaps. Thanks, James. Pretty good for England so far, not only on the scoreboard but also the pitch, which looks to have fewer snakes in the pit than yesterday. Beware Yasir, though, particularly in his targeting of Alastair Cook's pads, a bit like a cricketing Norman Hunter. Yasir bites yer legs. Right, time for me to hand over to Stephan Shemilt, who will take you through the afternoon session. Cricket writer Osman Samiuddin: "Mohammed Amir is on his way back. He's been playing second-tier cricket, bowling really well, he's got the swing going and his action is very much the same as it was. I can see him playing for Pakistan again before the end of the year. I think the public rehabilitation has been a bit too forced, but I would be fine with it." Cricket writer Osman Samiuddin: "The thing about the Pakistan system is that it is rickety and disorganised, but they are adept at spotting what makes a good player. Even to this day there exists a huge informal scouting network. Talent will come out in Pakistan cricket." Ben Turner: Compton could be Severus Snape. The one who waited in the wings for years and when he finally got his chance, it all went wrong. 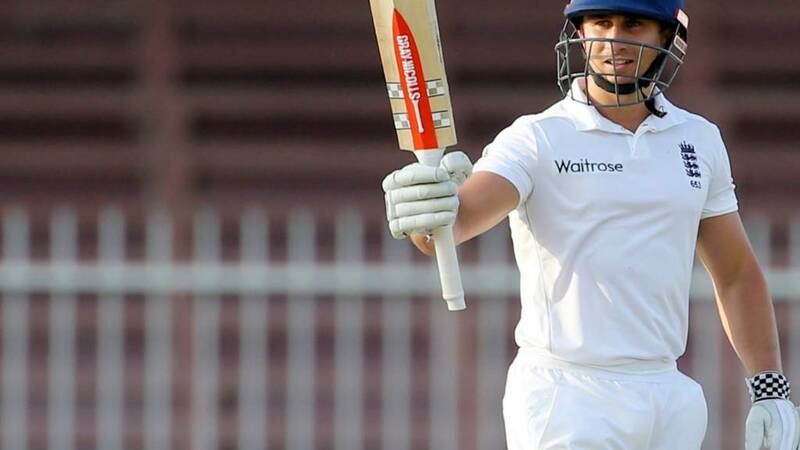 England had the better of the second morning of the third Test against Pakistan in Sharjah. The tourists had few alarms in reaching 87-1 in reply to Pakistan's 234 all out. The only wicket to fall was that of Moeen Ali, who played an awful slog sweep at Zulfiqar Babar and skied a catch to slip. But on a pitch looking less threatening than day one, Alastair Cook moved to 48 and Ian Bell 24 in an unbroken partnership of 68. Josh Bartholomew: Buttler told to play his natural game, easy to see why he doesn't with the criticism Moeen receives for getting out attacking. Ashley Barnett: I've a gambling theory that can make loads of money, but no patience to execute it, Ali has talent, but no the patience to open. "The pitch has been the story. It hasn't done as much as yesterday. In the first session yesterday the ball was spinning more than we've seen already. If England play Yasir Shah well then they should get a lead. However, how we've seen him bowl in the last 20 minutes - he could have a moment. It's a really good morning for England, they have read the situation well." Two short legs now for Alastair Cook - the old 'Ronnie Corbett' field. He gets off strike, before an increasingly fluent-looking Ian Bell times Yasir through a gap on the on side for four. That's lunch, and what an excellent session that has been for England. Richard Bannan: Joe Root is Mad-Eye Moody: dangerous, wasted talent and not really himself until shuffled into a different position. Zulfiqar back into the attack for a bit of spin before the interval. Cook clips him for a single. "Shah gets great energy on the ball because of his action. It's as if he's saying 'I'm going to get you out'. When I watch Adil Rashid, when he's at his worst he's almost apologetic." Ooh, goodness me, another heart in mouth moment for Alastair Cook - again he prods nervously at Yasir, gets an inside edge and the ball flies to safety rather than one of the close fielders. He's got a couple of overs until lunch - can he survive? Tom: Professor Quirrell springs to mind. Twitchy and nervous around certain wizards. Similar to Adam Lyth outside the off stump. Dave: Moeen must be Mad Eye Moody, he wants to kill instead of applying the Dementors kiss to the bowling. Not much happening for Wahab Riaz - he's trying to get a bit of reverse swing but can't get the ball to deviate off the straight and narrow. Bell plays out a maiden. "I hope Moeen realises that was such a high-risk shot. He's a better player than that and doesn't need to be playing those sort of shots. In Test cricket, you don't need to go into that zone." Shoaib Malik is having a horror morning in the field. After a sloppy misfield two overs ago, he commits another cardinal sin - attempting a lazy one-handed pick-up on the boundary rope and missing the ball entirely. And then a bit of a let-off for Alastair Cook - he pushes at Yasir, gets a little inside edge and is very fortunate to see the ball balloon to safety. "It's been very controlled. One lap slog from Bell to Babar was the only moment you thought there could be a wicket." Returning to our theme of the morning - the uncanny parallels between the job of Alastair Cook's opening partner and that of Defence Against the Dark Arts teacher at Hogwarts - we're currently debating on the cricket desk which opener would be which DADA teacher. Moeen as the overly flamboyant Gilderoy Lockhart? Compton as Lupin, the good one who you wish had stayed? Do let us know what you think via the usual channels: on Twitter at #bbccricket, by email to tms@bbc.co.uk, and via text to 81111. Cook flicks Wahab square for one. Totum: Moeen's Harry Potter character could be Bathilda Bagshot - just change the third letter of the surname to a "d".